In previous posts, we’ve highlighted our range of restoration services. From water damage removal in Missoula to local carpet cleaning to mold removal to general home restoration, we offer a thorough range of restoration services for folks in Missoula and beyond in Western Montana. In another posts, we’ve provided our readers with some practical tips about what to look for in a restoration company in Missoula, or really, anywhere. As a quick reminder, you want to make sure that the restoration company in question is certified and insured, for starters, but you also want to be wary of contractors who want a big down payment, or who seem like they are rushing through the quote process. We’ve seen and heard our fair share of horror stories from our clients and other businesses in this industry, so it’s key that you don’t let yourself get taken advantage of while you are in an emotional state after your home or place of business has incurred significant damage. It can be tough to not go with the first restoration company that promises the world without being thorough in their analysis, but we encourage you at HiCrest Restoration & Clean to do your best. Luckily, we do our best to blend speed and efficiency with care and attention to detail, so you have the best of both worlds. That’s just one way in which we differentiate ourselves from our competitors here at HiCrest Restoration & Clean. We are going to shift gears in today’s post: we are thrilled to be able to relay a few stories of successful restoration projects we’ve recently had. If you are interested in getting a real-life feel for how we go about our business, by all means, read on! On Christmas Eve, a pipe froze and broke in Unit A206, flooding the living room of the apartment and then leaking through the floor into the living room of Unit A106 below. The flood saturated the living room floor of Unit A206, and the entire living room area below in A106. This included the ceiling insulation and gypsum board (drywall). 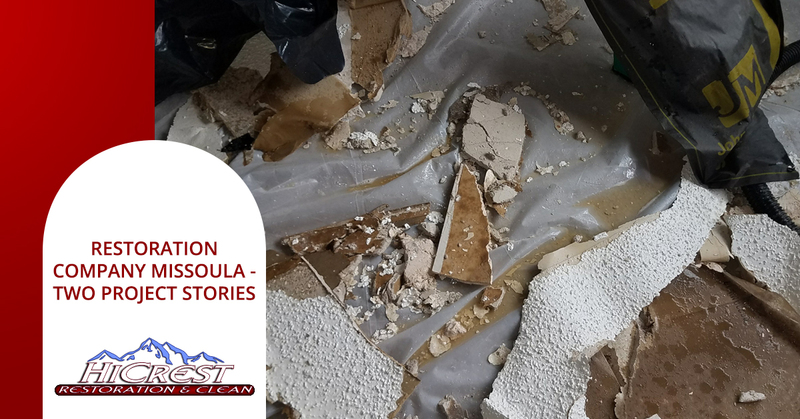 It also significantly damaged areas of the living room walls in Unit A106 where the water ran down both the interior and exterior of the gypsum board (drywall), saturating the drywall and the insulation in the walls. 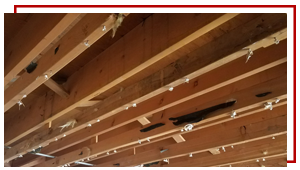 Even though it was a holiday, HiCrest Restoration responded immediately to mitigate further damage and begin the drying of both units, as we offer emergency restoration services any time of the day or night. This required deconstruction of the ceiling and walls in Unit A106 after the initial water extraction had been completed. HiCrest then monitored the drying solution over the next 4 days to ensure both units were completely dry prior to the restoration. Once this was accomplished, the rebuild phase could begin. 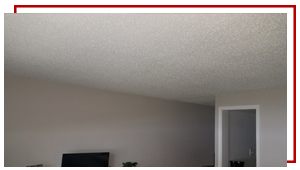 This phase included re-insulating all affected wall and ceiling areas of Unit A106, replacing and re-texturing and painting all affected drywall on the ceiling and walls. 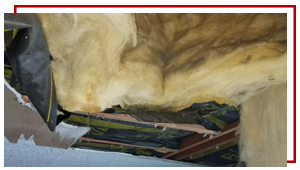 Obviously, an event with this degree of damage causes a lot of disruption to the occupants of both units, so HiCrest Restoration worked carefully so as to minimize the unavoidable inconvenience and all repairs were completed quickly and efficiently allowing both tenants to remain living in their units until complete. We do our best to do our job as well as we can while keeping those immediately affected by the damage in mind. Thursday night, 6pm, HiCrest Restoration received a call from a couple that had experienced the most unpleasant event: a significant sewer drainage backup from the floor drain in their basement bathroom that flooded the bathroom, and then leached under the bathroom walls into the adjoining hallway, closet, and basement/man cave/recreation room. Though after hours and with dinner on the stove, HiCrest Restoration on-call techs responded immediately to stop the flow of contaminants and mitigate any further damage as soon as possible. 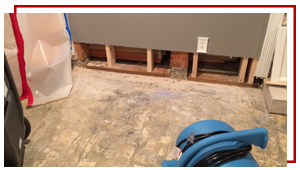 Once on site, the initial inspection revealed that the drainage backup had not just been from the bathroom floor drain, but had also backed up out of the main drain “clean out” which was located in another area of the basement. This secondary backup source caused much more of the basement area to be affected than initially thought by the homeowners. Due to this being Category-3 “dirty sewage water” event, the HiCrest team first erected a containment barrier to isolate the basement from the rest of the house to prevent the spread of any airborne contaminants. We then worked late into the night to extract all flood waters and remove all affected carpet, pad and drywall to get all the contaminants out of the house. The team also deconstructed the bathroom to remove the contaminated flooring, vanity, etc. The team then treated all affected areas with the appropriate antimicrobial solutions to clean and disinfect the contaminated area before putting the drying solution in place. Once the basement was dry, the rebuild and restoration phase included rebuilding the bathroom with new flooring, vanity, baseboard, drywall, texture and paint. 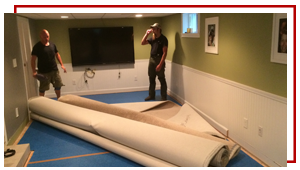 It also required new carpet and pad to be installed throughout the basement as well as replacing drywall and baseboard trim in all affected areas and then repainting before replacing the entertainment center and furniture. 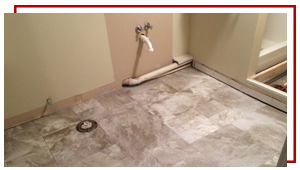 We are thorough and comprehensive at our restoration company in Missoula. From initial inspection to the job’s cleanup, you don’t have to worry about our dedication to completely resolving the issue. As a reminder, we offer water damage, smoke and fire damage cleanup, True Carpet Cleaning, mold removal, sewage cleanup, storm damage restoration, and emergency restoration services at HiCrest Restoration. We have a passion for helping our community when folks need it most. We are Missoula’s water damage specialists, but as we’ve listed above, we have a range of other services we employ to make sure your house becomes your home again. Do you have a commercial property that needs an inspection and cleanup? We’ve got you covered there too. And if you’d like to see additional images of our restoration projects, check out our gallery! Otherwise, reach out to us today if you need exceptional restoration services in Missoula or beyond!